North Face's Apex Bionic Jacket combines the best qualities of Windstopper™ fleece and a stretchy soft shell in one trim package. The Apex Bionic practically jumps out of the box when it comes to applications like downhill skiing, snowboarding, or cold-weather backcountry skiing, hiking, and climbing. This is a performance blockbuster and a Windstopper-killer. 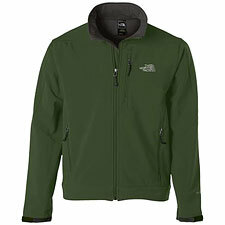 North Face uses its proprietary Apex Soft Shell fabric for the outer layer of the jacket. Apex fabric is similar to Schoeller's soft shell material, and comes in three individual weights. The Apex Bionic jacket features the heaviest weight, Apex ClimateBlock, which is said to be effectively windproof while still maintaining a reasonable degree of breathability. Unzip the Apex Bionic Jacket and inside is a clever surprise: a thin, light fleece insulation layer which adds considerable warmth and soft cozy against-the-skin comfort without adding unwanted bulk. The Apex Bionic Jacket thus offers the advantages of both a plain and an insulated jacket at a reasonable weight of one pound, seven ounces (men's medium). That weight, plus the fact that the Apex Bionic lacks a hood and pit zips for venting, makes the jacket a bit less appealing for multi-day winter or expedition-style mountaineering, or high-aerobic activities in mild weather. Aside from these specific limitations, skiers and mountaineers of all stripes will find much to fall in love with—especially as conditions turn cold and blustery. When the North Face gets something right, they really get it right, and that is the case here. The Apex Bionic Jacket looks and feels far more expensive than its modest $129 price tag. Start with subtle but intelligent design choices like rubber-backed Velcro cuff cinches—so you can snug up your wrists without having to take off your winter gloves. Of course you get a hem draw cord to keep powder from shooting up your torso, a chest pocket and two hand pockets (as well as TNF's high-quality snag-free zippers), and an inarguably sleek cut that will help insure you look good even if you're don't ski good. In keeping with its Alpine theme, the Apex Bionic's rugged exterior offers high-wear durability plus the comfort of a light, stretchy shell that won't impede your mobility. For a windblocking shell, the Apex Bionic is admirably good at keeping you warm but not too warm. With regard to breathability, I'm undecided as to whether the fabric outperforms a heavyweight windstopper fleece jacket like Patagonia's R4 Fleece Jacket. This is always a subjective call, but the Apex Bionic does seem fairly "airy". However, if you're a hard-charging climber, you'll probably want the Apex Bionic wrapped around your waist (or in your pack) on the uphill. The Apex Soft Shell fabric is DWR-coated to help it shed water, which means you can blast through most every foul weather condition except sustained heavy rain. With performance versatility like that, it's easy to see why soft shell jackets in general have become more popular than hard waterproof shells—and why the Apex Bionic is such a bestseller.